As you all know, we at the Disney Film Project have been amped to see this film since the year 1920. Okay, I’m pushing it…maybe since 2011. Before we knew it, May 4th arrived, which turned into one of my favorite days ever. I was like a child entering into the theatre. I bounced happily into my seat and was prepared for the best. Little did I know that not only would my expectations be met but they would exceed anything I had imagined. For something we had discussed/referenced on the podcast for over a year, this was the longest geek-out session ever known to man. 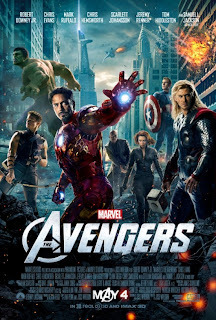 The Avengers was directed and written by Joss Whedon, who is quite a brilliant individual. Credit must also be given to the talent of Michael Baiardi, who wrote the interestingly cool song “Black Dirt” for the film. Now, I do not read comic books. I have never had the desire or the attention span for that. However, since May 4, my world has changed. I now anxiously want to sit down and read comic books about Captain America and how he came to be, then re-watch the film to compare. Perhaps I might blog about that at some point as well. This is two hours and 23 minutes of pure awesomeness. Each character brings his own flavor. The commercials seriously do not do the film justice. They are exciting, yes, but nothing like the actual film itself. Although Stark’s humor rings throughout, The Avengers is so much more than that. Action, violence, and comedy are indeed the main themes of this film, but none out-do the other. They balance out beautifully and evenly to produce quite an epic masterpiece. As much as I love the entire cast, my absolute favorite character in the duration of the film is Loki, played by Tom Hiddleston. He is beyond fantastic and words cannot describe how much I appreciate his acting ability in this film. However, I also think Mark Ruffalo did a wonderful job as Bruce Banner/Hulk, while Scarlett Johansson also proved her worth as Black Widow. I have not seen such a well-cast film in a very long time. Kudos to the entire crew of this amazing film. Each character has a tremendous amount of depth which certainly shows itself through the actor’s dedication. My two favorite films are The Little Mermaid and Pirates of the Caribbean: Curse of the Black Pearl. After seeing The Avengers, I can now say that I have THREE favorite films. Thank you, Joss Whedon, for your intelligence and for listening to your heart when writing this film. I cannot wait for Saturday to be able to sit down with my fellow co-hosts and producer so we can enjoy the fun together. Friends assemble! Pssst...when you listen to The Avengers podcast episode, be sure to keep an ear out for our future Twitter hashtag. Conspiracy theories rock! An Update - Tweetwatches, Meet Ups and More!